Prophase is the starting stage of cell division in eukaryotes. Prophase, in both mitosis and meiosis, is recognized by the condensing of chromosomes and separation of the centrioles in the centrosome. This organelle controls the microtubules in the cell, and each centriole is one half of the organelle. During prophase, they separate to provide microtubule centers in each new cell. Organelles, chromosomes, and many other substances and structures are moved about the cell by microtubules and associated proteins. These structures together are known as molecular motors and drive many cell processes. Prophase begins cell division by separating the centers for these molecular motors, and condensing the chromosomes. Mitosis occurs after interphase in eukaryotes. During interphase, the DNA is replicated, along with the organelles necessary to divide. This includes the centrosome, within which the centriole gets replicated. With a replicated genome and organelles, the cell can begin mitosis. The first stage of mitosis is prophase, and it sets the stage for the later stages of mitosis. During interphase preceding mitosis, the chromosomes exist in a loose state. At the onset of prophase, proteins associated with the DNA are activated, and the DNA winds around them and bundles in dense shapes. Under a microscope, this stage can be seen as a darkening of different places in the nucleus. Another component of the nucleus, the nucleolus, disappears during prophase. The nucleolus is a dark spot in the nucleus that contains RNA and proteins responsible for creating ribosomes. Ribosomes are the large protein and RNA complexes that create other proteins. Because the cell seizes to transcribe new RNA during cell division, this complex can be disassembled and distributed to each new cell. It will be reassembled after the cells divide. In plants, a stage precedes prophase in which the nucleus is moved into the center of the cell, and the large water-filled vacuole is moved out of the way. Some plants also lack centrosomes, and organize their microtubules in different ways. During preprophase, these mechanisms are set up. Like animals, the chromosomes condense and can be seen, and the nucleolus disappears during prophase. After prophase of mitosis, the chromosomes with will attached to microtubules, arranged in the middle of the cell, and the sister chromatids of every chromosome will be separated into new cells. In this way, the cells will be identical to the cell that existed before the DNA was copied. Each cell will still have homologous pairs of chromosomes that carry different alleles for each gene. During prophase of mitosis, the molecular motors and necessary condensation of the DNA allows the sister chromatids to be separated. There are two stages of prophase during meiosis. Meiosis consists of two separate cell divisions, separated by a phase known as interkinesis. The first division of meiosis, meiosis I starts after a cell goes through interphase. As in the case of interphase preceding mitosis, each chromosome is replicated during synthesis of interphase. Thus, when meiosis starts, there are two copies of each chromosome, attached as sister chromatids in the same chromosome. During prophase I, the chromosomes condense, as in mitosis. However, the homologous chromosomes also pair in prophase I. When the homologous chromosomes pair up, portions of the DNA on different chromosomes are able to swap. 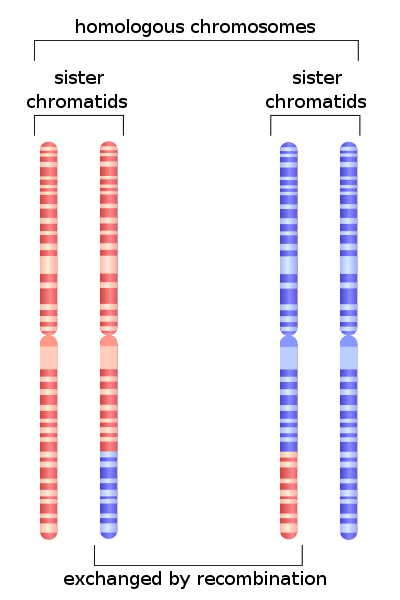 This recombines the alleles present on each chromosome, as seen in the image below. After prophase I, meiosis I proceeds to divide the contents of the cell. Unlike in mitosis, the sister chromosomes stay together through meiosis I, but the homologous chromosomes are separated. Each homologous chromosome carries different alleles for each gene. Throughout meiosis I, these homologous chromosomes are separated, which leads to the law of segregation. This insures that sexual organisms can pass on either allele for any gene, regardless of the phenotypic relationship between the alleles. In this way, recessive alleles can exist in organism that act as “carriers” of the allele, not showing the phenotypic effects of the allele, but passing it on the offspring. This ensures that each generation can contain variability which can help populations survive changes in the environment. After meiosis I, the two daughter cells take a short break, called interkinesis. During this break, the DNA does not replicate, because it already consists of duplicated strands of DNA attached at the centromere. Though the DNA exists as duplicate sister chromatids, only one half of each homologous pair is present in each cell. As in prophase of mitosis, the centrosome containing microtubules separates to each side of each cell during prophase II. The nucleus starts to break down, and the chromosomes condensed again, in preparation to be moved and separated. During the remainder of meiosis II, the sister chromatids of each chromosome will be separated into two new cells. By the end of meiosis, there will be 4 total cells, from a single starting cell. Although prophase II is very similar to prophase of mitosis, the complicated actions in prophase I allow sexually reproducing organisms to reduce their ploidy in preparation for a fertilization event between cells from two different organisms. Preprophase – The stage immediately preceding prophase in plants. Centromere – A region on chromosomes that binds sister chromatids together and gives microtubules a place to attach. Centrosome – The organelle responsible for organizing microtubules. Molecular Motors – Proteins and microtubules that can work together to transport structures through the cytosol of a cell. 1. Bacterial cells undergo cell division as well. However, bacteria do no need to condense their small DNA rings before separation occurs. Do bacteria have a prophase? B is correct. The purpose of prophase is to condense the DNA, and prepare the cellular machinery to move chromosomes and organelles around the cell. Without chromosomes or organelles, bacteria do not need to go through prophase in order to divide. However, they still use microtubules and molecular motors to divide the contents of their cells. 2. A cell is undergoing meiosis. The first cell division has taken place, the cell has rested a time, and the chromosomes are starting to condense again. What stage is the cell in? C is correct. Prophase occurs in mitosis, and prophase I occurs in the first division of meiosis, meiosis I. Prophase II occurs in the second division of gametic cells, and is distinguished by the chromosomes condensing and the centrosome dividing to either side of the cell. 3. In fungi, chromosomes condense and centrosomes break apart. However, the nuclear envelope never breaks down. Mitosis or meiosis proceed, but inside of the nucleus until the cell is divided. When does prophase occur in fungi? B is correct. Fungi, like all eukaryotic organisms, must condense their chromosomes before trying to divide them, or they would become damaged. This still happens in prophase, in either mitosis or meiosis. The difference is that prometaphase is missing, in which the nuclear envelope degrades completely into small vesicles of membrane. In fungi, cell division proceeds and the nucleus is divided after the chromosomes have been divided.